Shown in the photo are Metrobank Chairman Arthur Ty (3rd from left); Federal Land Chairman and GTFI President Alfred Ty (2nd from right); GT Foundation Vice President Anjanette Dy Buncio (leftmost); GT Foundation Assistant Vice President Alesandra Ty (2nd from right), Metrobank Foundation President Aniceto Sobrepeña (rightmost) and the beneficiaries of the program. 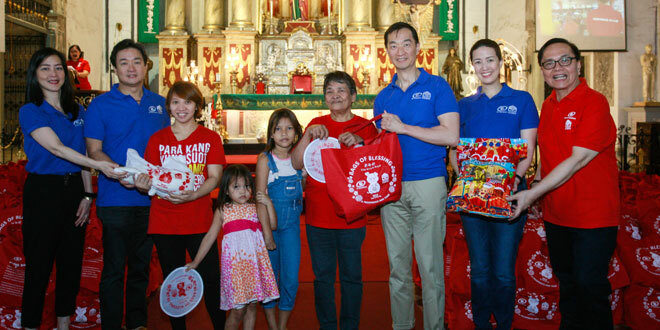 GT Foundation, Inc. (GTFI) and Metrobank Foundation, Inc. (MBFI) kicked off this year’s “Bags of Blessing”, a week-long distribution of P10 million worth of food packages to 10,000 families, on February 5 at San Agustin Church in Intramuros, Manila. Simultaneous distributions also happened in San Fernando City, Pampanga; Dagupan City; Batangas City; Tagbiliran City; Puerto Princesa City; Guiuan, Eastern Samar; General Santos City; and Tandag City, Surigao del Sur. Since its inception in 2010, the Bags of Blessing has always been envisioned by the late Metrobank Group chairman and founder Dr. George S.K. Ty as a way to reach out to underprivileged families and provide them a privilege to take part in the celebration of Chinese New Year. Spearheaded by the Ty family foundation—GTFI, together with the MBFI, the annual Bags of Blessing shall carry on a tradition to share blessings with the needy and create venues to have a meaningful way of welcoming and celebrating the Chinese New Year. Companies, subsidiaries, and affiliates under the Metrobank Group and GT Capital Holdings, as well as the network of select Metrobank branches nationwide, will take part in this annual undertaking. The traditional ang-pao (a red envelope containing cash used to deliver best wishes, luck, good energy and happiness) is the inspiration. However, instead of cash-giving, specially designed red bags containing 1,000 peso worth of grocery items (snack packs, rice, canned goods, and other daily needs of the Filipino consumer) are distributed to poor families carefully selected by the Catholic Bishops’ Conference of the Philippines (CBCP), through its national network of Diocesan Action Centers. Other than belonging to the status of living below the poverty line, families affected by recent calamities, Indigenous Peoples (IPs), and non-beneficiaries of the Pantawid Pamliyang Pilipino Program (4Ps) are given priority. “As we welcome the Year of the Earth Pig, we are passionate in continuing the legacy that our beloved Group chairman Dr. George S.K. Ty has instilled in each of us. He envisioned this project to be able to reach out to those who are marginalized who do not have as much. It is heart-warming to see the effort and presence of the Ty family and the rest of the Metrobank Group in keeping this tradition alive”, said MBFI President and GTFI Executive Director Aniceto Sobrepeña. Consistent with Metrobank’s heart for the community core value, almost 2,000 volunteers generously donated their time to repack and distribute goods in the previous year. This 2019, it is expected that employee volunteers will assist in the different distribution sites. Purchasing of goods has begun as early as December with some employee volunteers taking their time out in the repacking of goods. Distributions for 500 families each will be conducted in the succeeding days in churches located at Quezon Avenue (Quezon City); Marikina City; Imus City (Cavite); and 400 families each for Malolos City (Bulacan); Angeles City (Pampanga); Municipality of Caoayan (Ilocos Sur); Tuguegarao City (Cagayan); Calamba City (Laguna); Talisay City (Cebu); Bacolod City; La Paz (Iloilo City); Davao City; Zamboanga City; Naga City; South Cotabato; and Misamis Oriental.